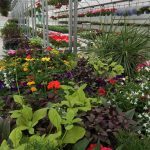 Our Oswego Farmstand is now open with premium flowers, hanging baskets, mixed planters, flats, and specialty annuals as well as perennials! Don’t forget your herb and vegetable plants, too! Our knowledgeable staff can help you find what you are looking for. Both Naperville and Oswego Farmstands are open M-F 9-6, Sat & Sun 9-5. 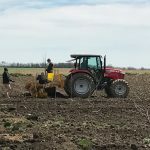 Oswego Farmstand will open Wednesday! Our Oswego Farmstand will open on Wednesday! Our Naperville Farmstand is now open. Swing by either location and say hello! We’ve missed you. 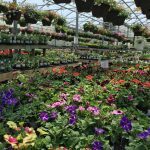 We carry a large selection of premium flowers, hanging baskets, mixed planters, annuals, and perennials. Need herb or vegetable plants? We’ve got them. See you soon! Amid chilly temps on Saturday, the guys were out planting more apple trees. Jonagold, Jonathan, McIntosh, Honeygold, and Snow Sweet were planted. Mmmm! 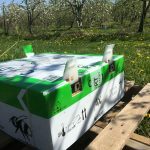 How do we get bees to come to our farm to pollinate the apple orchard? We order them through the mail! Our bees arrived by UPS this week. Roughly 3,000 bumblebees are now getting to work pollinating those apple blossoms! Nature at its best! Our resident honeybees will start pollinating when the weather warms up. 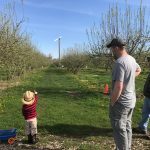 Frank, Marty, and Marty’s oldest child are checking out the new apple orchard fan. 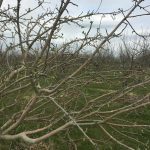 When temps dip too low in spring, it will pull warmer air from above and circulate it around the orchard. This may save our future apple crops when we get late freezes. Naperville Farmstand opens this Friday! Our Naperville Farmstand opens on Friday, April 21st! 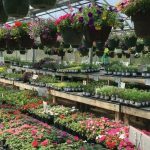 Come shop for your premium flowers, hanging baskets, mixed planters, flats, and specialty annuals as well as perennials. We also offer a large selection of vegetable and herb plants. Our knowledgeable staff can help you find what you are looking for! We will be open M-F 9-6, Sat & Sun 9-5. This Zestar apple tree is waking up from its winter slumber. Look carefully and you’ll see small leaves on the branches! Sign up to receive our monthly newsletter with farm and farmstand updates! Don’t forget to follow us on your favorite social media platforms for the latest updates and announcements, contests, feedback and reviews, recipes, and photographs.